Meeting strangers can be anxiety-inducing or fun or a mix of each, depending on your degree of introversion. An audience member, seated in the semi-dark, faced with actors usually feels quite safe (short of the fear of unanticipated participation), but when the performers are playing themselves and revealing sometimes disturbing features of their lives, you might feel some real-life discomfort. It’s less likely these days after nearly four decades of what was once disparagingly labelled “confessional” performance in the 1980s, but it’s a not uncommon feeling and one that in fact makes (let’s call it) “reality theatre” attractive, especially when it’s tied to a social, cultural or political issue or community that we have limited understanding of and for which we feel concern. 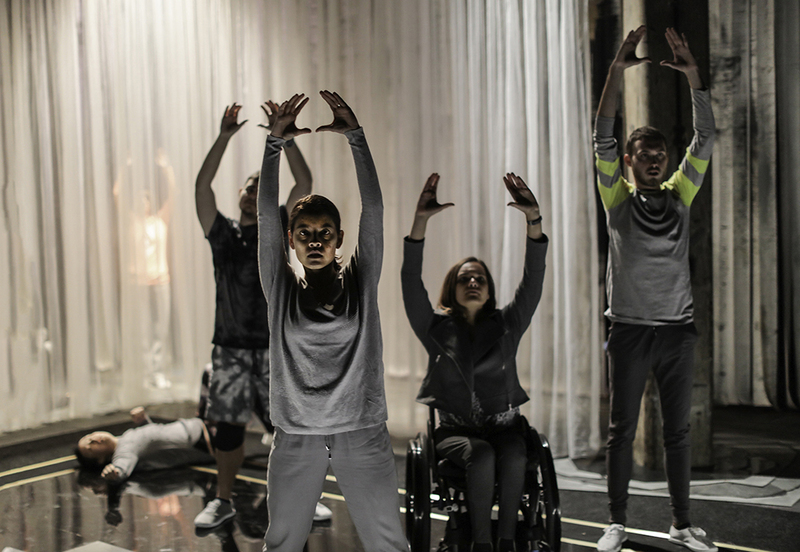 Shopfront’s Harness Ensemble of performers with a disability and the Australian Theatre for Young People have come together to make Dignity of Risk. In ATYP Studio 1, the multiracial, mixed ability group of 11 young women and men (possibly late teens to late 20s) stand or sit facing us in low light while we listen to their recorded voices in a stream of utterances, each no more than a sentence long, offering clues about how they view themselves and the world. Aptly, the first concern is with appearance, how they think they look and feel about being looked at. Some care, some don’t. The next time they speak it’s live and we begin to match voices with bodies and as more of these utterances are presented and with more detail and in occasional solo passages, we build a cumulative sense of each performer, not a complete picture, but enough to register dimensions of a personality from fragments of appearance, movement, information and interaction. Essentially, Dignity of Risk is a first meeting, and, if it stays with us, might affect our attitudes to the people these 11 actors represent to varying degrees. A true meeting would require our interaction with them and people like them. Perhaps that will come, and should, in an empathy-challenged Australia. These actors generously open up to us so that, in turn, we might be openly receptive and inclusive. Litanies of “Don’ts” and “Wishes,” from the humble (“When am I allowed to get drunk?”) to the unusual (to be a 40-year-old out-of-touch-with-fashion dad, perhaps a desire for normality) and others reveal that those with and without disability share everyday anxieties and the weight of depression. We hear of suicidal impulses, bipolarity, the stress of a broken marriage and the hurt of racial prejudice and cruel utterances like, “If I’d been your parents I would have killed you at birth.” These are tempered with good humoured self-deprecation, amusing anecdotes and bouts of party dancing to James Brown’s artful electronica and Fausto Brusamolino’s cascading colours. One of the strongest scenes comes late in Dignity of Risk as each of the actors jostles for a place in a hierarchy of disadvantage. The engaging and lanky Caspar Hardaker feels he’s been victimised for being a straight white male, which rouses a laugh from his comrades, but he returns to it with conviction, revealing the extremity of his depression. After itemising her considerable medical and other challenges, a relatively quiet Teneile English wryly declares herself the most advantaged because she’s got a very good, well-paid job. It’s a lovely swerve and comes out of a scene in which the actors are actually talking to each other rather than to us. Another unusual moment features Mathew Coslovi standing centrestage and simply changing from his clothes into an identical set with an air of conviction about the rightness of the task. 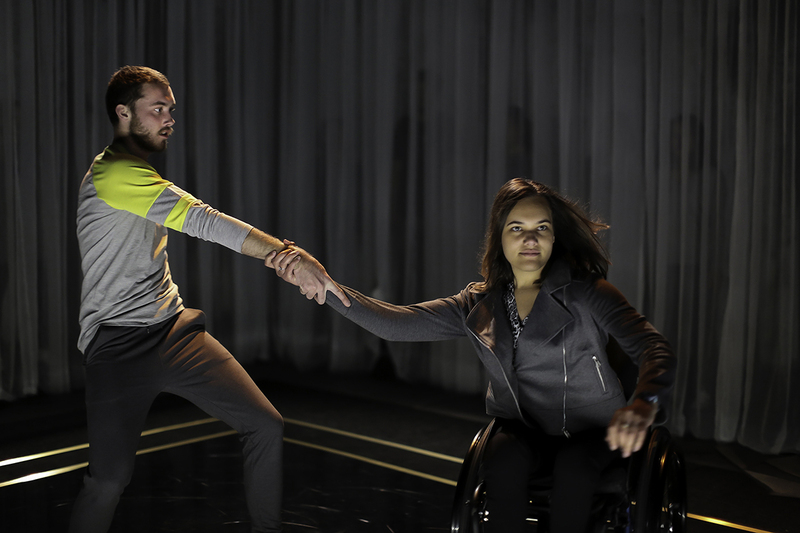 Riana Shakirra Head-Toussaint (a lawyer and disability activist) in a wheelchair and Jake Pafumi perform a striking role-reversal duet in which Pafumi first does the pushing but is soon pulled along by Riana and then rests on and arches out from her lap. Later, when the set’s soft curtain falls to the floor, Pafumi picks up one end of it and progressing across the stage, gently wraps it around himself in an act of unemphatic cross-dressing. Designer Melanie Liertz’ set comprises sleek black, reflective flooring framed by the semi-transparent curtains mentioned above. These are dreamily lit, falling away to reveal long narrow panels of firmer material splashed with dark colours, suggestive of a wider, perhaps tougher world, although the correlation isn’t clear, especially when the performers move slowly in and around this second curtain, stroking, lifting and letting the panels fall. Liertz’ design, Busalomino’s lighting and Brown’s tautly composed and rhythmically diverse score collectively complement the cumulative layerings that constitute the personalities of the performers. Margot Politis’ choreography has its moments — the wheelchair duet and pummelling fists and stamping in another scene and in Holly Craig’s solo — but hasn’t realised a consistent, simple vocabulary apt for the work, resulting in an unrevealing looseness in an otherwise tightly ordered production. Holly Craig, who expresses her concerns about being able to look after her dog and knows that she has to be in care, affectingly brings home the complexity of the issues that drive Dignity of Risk. The production’s title is the same as the medical and social policy protocol “Dignity of Risk” which is about respecting each individual’s autonomy and self-determination (or “dignity”) to make choices for himself or herself, despite (“reasonable” is sometimes inserted here) risks. Sometimes Duty of Care clashes with Dignity of Risk, as in the case of sports people with disabilities. The extent to which the performers with a disability other than Holly might be at risk had to be largely guessed at. Given the title of the work, I wanted to ask, what risks, physical, emotional or intellectual, might these people actually take to maintain or achieve dignity; but this issue is not seriously canvassed. Instead, the production asks us, at the very least, to listen and to accept the right of people at risk to dream, express and test their limits just as their fellow cast members without disabilities do. While I felt that the notion of “risk” was insufficiently probed, that movement could have been more considered and the theatrically well-worn litany structure, while working well initially, limited a sense of conversation, Dignity of Risk nonetheless granted me a revealing first encounter with a fascinating group of strangers. Their frankness, moments of eccentricity, anxiety and passion and their determination opened me to their various worlds. Under Natalie Rose’s direction they seized the stage with fluency and confidence — that’s risk-taking.